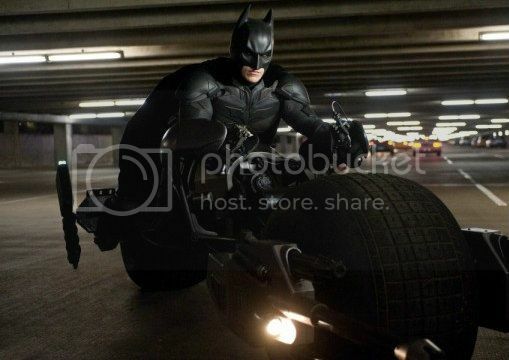 Review: The Dark Knight Rises / It's Just Movies Review: "The Dark Knight Rises"
“The Dark Knight Rises” is the third and final film in Christopher Nolan’s trilogy. Starting off in 2005 with “Batman Begins,” continuing with 2008’s “The Dark Knight,” it all ends now with “The Dark Knight Rises,” a fitting conclusion that has been very well planned from the beginning. “The Dark Knight Rises” picks up eight years after the events of “The Dark Knight.” A party is being held to celebrate Harvey Dent Day and the fact that Gotham City is nearly crime free thanks to a law created in the fallen District Attorneys name that has put every major criminal behind bars. Commissioner Jim Gordon (Gary Oldman) has been living with the guilt of having to lie and make Batman an outlaw all those years ago, after which he was never spotted again. Bruce Wayne (Christian Bale) has become a recluse and steeped deep into depression after the death of Rachel Dawes and has given up being Batman forever. We are quickly introduced to Selina Kyle (Anne Hathaway) who proves to be sly and cunning when she robs Wayne and escapes the now cane-dependent and weaker Bruce Wayne. We also meet Miranda Tate (Marion Cotillard), an executive member on the Wayne Enterprises board who wants to draw Bruce Wayne back out to help his struggling company and work towards regaining his father’s legacy of helping people through technology and inventions. We come to find out that the city isn’t so criminal free as a mercenary named Bane (Tom Hardy) has an army busy at work beneath the city and once he reveals himself, Wayne must once again put on the costume and become Batman to stop this devious monster, much to the dismay of his life-long friend and butler Alfred (Michael Caine) who doesn’t believe that he needs to don the cowl and cape anymore. With help from his old friend Lucius Fox (Morgan Freeman) and some new gadgets that he has saved for him over the years, Batman is back in the crime fighting game. When the time comes for mono-a –mono fight Bane’s ruthlessness and anger is too much for him in this weakened state and he is defeated and imprisoned. With Batman out of the way Bane is free to terrorize and control the city. With all exits out of the city destroyed and the Gotham Police force neutralized it seems like Bane is going to win. A young cop John Blake (Joseph Gordon-Levitt) emerges and aligns himself with Commissioner Gordon to stop Bane as he plans to decimate the city. With so many new people in Bruce Wayne’s life he must pick and choose who to trust and who has a secret agenda, will Batman be able to save the city he has sworn to protect. Lines have been drawn and it’s a full blown war and victory could go to either side depending if Batman chooses the right people to trust! “The Dark Knight Rises” is the crowning jewel in an epic trilogy by Christopher Nolan, who has masterfully crafted a powerful, action-packed and awe-inspiring tale of the hero in a much more modern and realistic world than seen in the comics. Keeping the characters and their motivations very close to their comic counterparts, we get a terrifying look at Bane and the power of his anger, Selina Kyle and how she seems like a villain one moment and an ally the next never knowing which road she will choose in the end. While the movie seems to inspire hope, the scale of chaos and anarchy is far beyond anything we have seen before. This is what makes the outcome so uncertain for our hero, his friends and the city of Gotham. While it is inevitable that Tom Hardy’s Bane will be compared to Heath Ledger’s award-winning performance as the Joker in “The Dark Knight,” each performance should be viewed and judged separately. Seeing as Heath Ledger was amazing and then his untimely death, that role will never be topped in our minds and hearts. Tom Hardy –although nowhere near as big in stature as the character was originally drawn- he is a force of nature nonetheless and should not be messed with. His barbaric and brutal fighting skills along with unmatched strength are enough to put fear in everyone and he is a worthy opponent for Batman. The way the film was written is so clever and precise. Nolan’s ability to craft the story in a full-circle where themes, storylines, characters and past issues from the previous two movies return and are a major factor in the outcome of this final film. These characters and the story envelop you so much that the movie’s 164-minute running time went by quickly for me. Could it have been slightly shorter? Perhaps, but every moment onscreen is something you need to see and I would find it hard to choose what didn’t need to be in the film. I was asked immediately after the film concluded what I thought of it and my first impression was that it was right up there with “The Dark Knight,” but maybe slightly below it. I will say that I have seen “The Dark Knight” dozens of times and have uncovered all it has to offer, so to have a fair assessment and comparison I will need to see “The Dark Knight Rises” again to found out what new details I discover after multiple viewings. Needless to say, this film is a must-see on the big screen and I think that fans — and even those who aren’t familiar with the franchise — can watch and enjoy it. A line from “The Dark Knight” can be applied here to master craftsman Christopher Nolan, he is the hero that this saga needed and deserved and no other director could have achieved all that he has with this story. “The Dark Knight Rises” is a fitting tribute and end to this tale of The Dark Knight. “The Dark Knight Rises” opens in theaters at midnight tonight, and is rated PG-13 for intense sequences of violence and action, sensuality and language. This movie kind of disappointed me. I’m not going to lie about it. nice review. I thought the movie was well done, and the ending was exciting. It was a very well told story with a fitting ending. Hathaway surprised me, I thought she would be bad, but she was very good. Loved Levitt’s character and role in the movie. Great review though your opening line ‘a fitting conclusion that has been planned since the beginning’ is contradicted by Nolan’s Farewell letter because he said that a Trilogy wasn’t planned, they made each movie as they went but had to end it at three. The Dark Knight Rises is my fave of the Trilogy because of the performances of Bale, Hardy, Hathaway and especially Caine, in the Dark Knight it was only really Ledger and Eckart that stood out. But i did think the Dark Knight had the better start out of the Trilogy. Over-rated movie. Too long and too many plot holes.